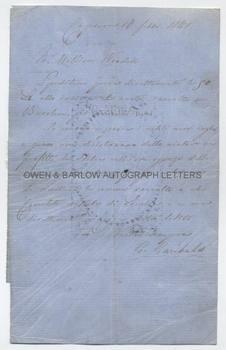 GIUSEPPE GARIBALDI Autograph Letter Signed. Italian patriot, soldier and politician. ALS. 1p. Caprera. 10th February 1861. To William Woodall. Together with a 19th century albumen photograph of Garibaldi and his men and three carte de visite portraits. The letter is in Italian and is untranslated but is a letter to William Woodall thanking him for a donation from the people of Burslem of £50 to the Garibaldi Fund. Mentioning London and other matters. 8vo. Approx 8.5 x 6.25 inches. The letter is on thin blue paper and has mounting residue to verso where formerly laid down in an album. There is fine creasing to the surface and some offsetting from the portrait photograph of Garibaldi that was previously mounted opposite to the letter in the album. All else very good. 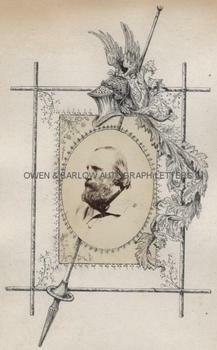 The first carte de visite portrait is a fine head and shoulders portrait laid down on card from an album leaf with a border of fine original pen-work decoration. The other two cartes are a small oval photographic portrait and a portrait of Garibaldi on horseback reproduced from a drawing. The larger albumen photograph shows Garibaldi and a group of his followers outside a white house (believed to be on Caprera). This last measures approx 5.5 x 4.25 inches and is laid down by the edges to card mount. 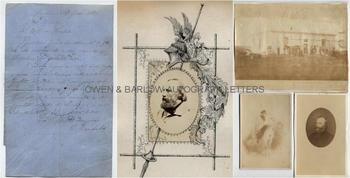 All photographs are contemporaneous with the letter and date from the early 1860s. 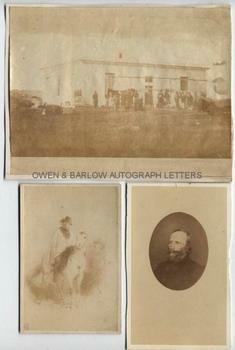 The photographs are somewhat faded but are else in very good or fine condition. Garibaldi had led the military expedition into Southern Italy in 1860 which effectively concluded the unification of Italy. His progress had been closely followed by admirers abroad and, in England, he had become a public cause for the Liberal Party. Two funds were established, the 'Emancipation of Italy Fund' and the 'Garibaldi Fund', which raised £30,000 between 1856 and 1861. Both Florence Nightingale and CHARLES DICKENS gave money to the fund. According to 'Garibaldi: Invention of a Hero' by Lucy Riall, the inhabitants of the Potteries town of Burslem had been amongst the major contributors by opening a shilling subscription scheme, that by the end of the year is said to have raised the colossal sum of £500. However, this letter from Garibaldi, acknowledging the sum of £50, would suggest that either the sum raised at Burslem was exaggerated or that the money was sent in instalments. From a 19th century collection made by William Woodall, the radical Liberal M.P. for Stoke-on-Trent and Hanley, who was a fervent admirer of Garibaldi and the orchestrator of the Burslem Garibaldi Fund.